Any­one vis­it­ing the Ashokan Water­shed may notice the num­ber of roads cross­ing the streams. If not prop­erly sized and placed, roads, bridges and cul­verts can cre­ate prob­lems for the stream and sur­round­ing com­mu­ni­ties. A bridge that is too small can con­strict and back up water. 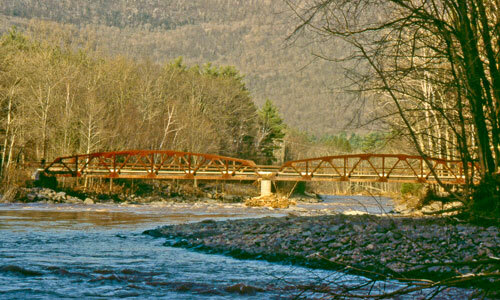 This backed-up water may flood nearby prop­er­ties and cause rocks and debris to accu­mu­late behind the bridge. Flood flows divert­ing around sed­i­ment and debris piles can erode stream­banks and under­cut bridge sup­ports. Cul­verts (usu­ally hard plas­tic or metal pipes that con­vey water under­neath a road cross­ing) that are too small often have the same effect. If cross­ings are not aligned prop­erly with the stream course, they can direct water into stream­banks and cause ero­sion. Under­sized or improp­erly installed cul­verts can become fish pas­sage barriers. The Ashokan Water­shed Stream Man­age­ment Pro­gram (AWSMP) works with local, county, and state high­way depart­ments to prop­erly size and align stream cross­ings in order to pro­mote chan­nel sta­bil­ity, pre­vent flood­ing and debris build-up, and main­tain aquatic organ­ism pas­sage. These improve­ments have the ben­e­fit of increas­ing the lifes­pan of road infra­struc­ture and reduc­ing dam­age dur­ing high water events.